Many times I have walked past the restaurant on my way to Myth Cafe for lunch (3.03.07, 4.22.07 and 11.27.07), peering wistfully into the darkened restaurant next door and making a mental note to come back for dinner. Well my friends, that day has finally come and gone and it was a dinner never to be repeated as according to this article in the SF Chronicle, the restaurant has been sold. The new owners have agreed to keep the name, concept and most of the staff; however, the company has its own corporate chef and wine director, so Chef O’Brien’s last day was 1.31.08. When I heard about this, I quickly made reservations for dinner with JT and CK (who I think may have come with me on most of my lunches at the cafe) for Thursday, January 31st, the last meal so to speak, with Chef O’Brien at the helm. 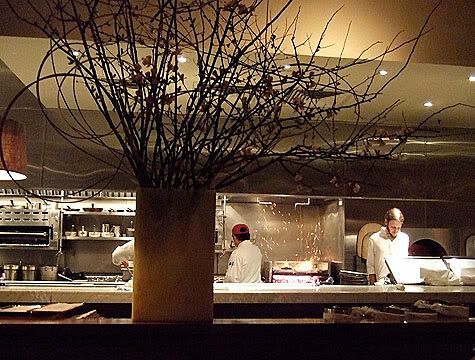 We sat facing the exhibition kitchen which had a wood burning stove enthusiastically spouting sparks like fireworks and was dramatically lit by overhead lights focused on the crisp white chef’s jackets bustling in the kitchen. 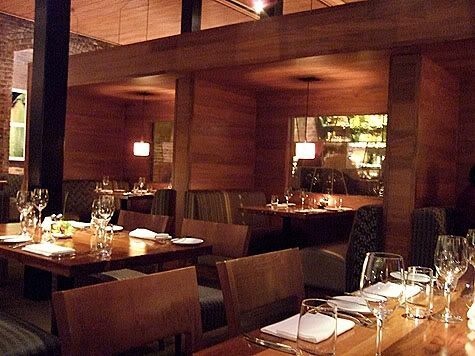 The building interior has high wood ceilings with soaring brick walls that break up the space into intimate cubbyholes and private dining sections. 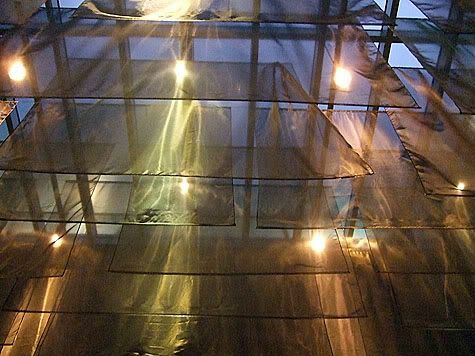 The main dining area where we were seated had a huge overhead skylight that was obscured by a flotilla of gossamer fine metallic panels that both reflected and diffused the forest of dangling lights. 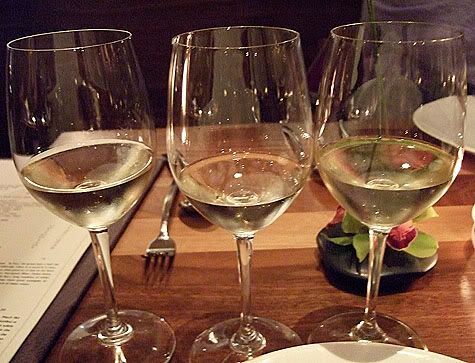 We decided to be festive and all tried the wine flights of three 2-oz servings. JT and I with the Northern Italian Whites (15) of Arneis, Molino, Langhe (2005), Cortese, La Slina, Gavi (Piemonte), Vernaccia, Panizzi, Vernaccia di San Gimignano, Tuscany. CK going the mostly red route of Friullian Wines of Dorigo (20), which still included one glass of white wine: Ribolla Gialla, Colli Oientali del Friuli (2006), Cabernet Franc, and Schioppettino. 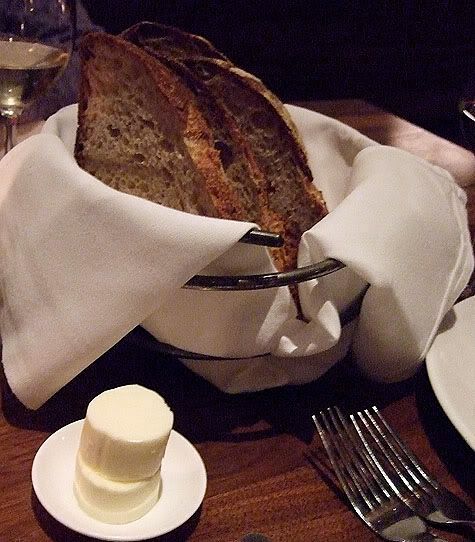 Here is our basket of bread which was filled with huge slabs of rustic sourdough, served with sweet creamy butter. To maximize our tasting options, we decided to order six dishes from various sections of the menu and shared everything. 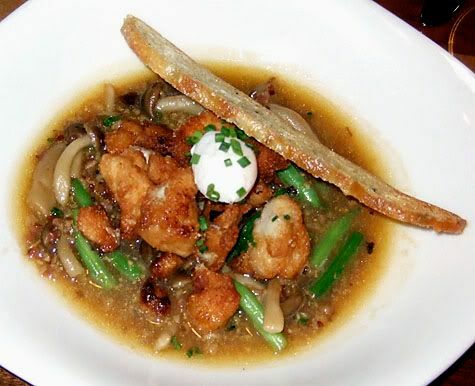 We started with Seared Sweetbreads with bacon, sherry vinegar, and beech mushrooms topped with a poached quail egg and a long and elegantly thin slice of crispy toast (13). The sweetbreads are crispy and chewy on the outside and filled with an ethereal slightly spongey rich goo that fills your mouth with a luscious fatty sensation. I am unable to identify any particular taste beyond the bacon and sherry vinegar which balances nicely with the fried aspect of the sweetbreads. Note: the cafe next door serves small bits of these fried delicacies strewn about their carrot soup which is fantastic. 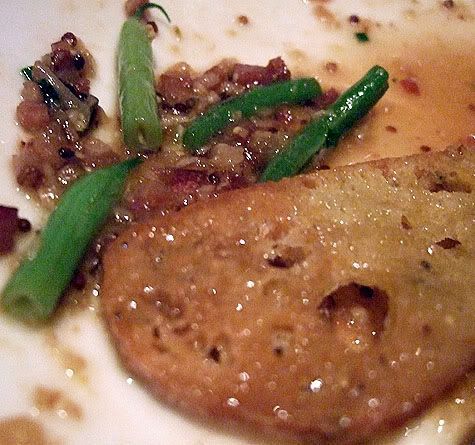 There were also short lengths of lightly cooked green beans that added the perfect amount of vegetable crispness to lighten up the sauce that is very rich with generous bits of crisp, chewy bacon. Caribbean Shrimp Poke (12) with cucumber, shiso, hijiki, soy sauce, edamame and sprinkled with toasted kukui nut. 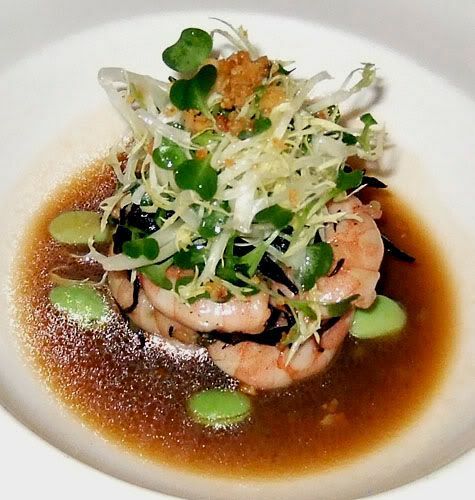 This was essentially a Japanese dish, with few deviations such as the addition of fresh herbs and some leaves of frisee lettuce. The shrimp was cooked until just tender and the dressing was a brightly acidic counterpoint to the other dishes we ordered. Here is a link to a similar recipe posted on the Food and Wine Magazine website. 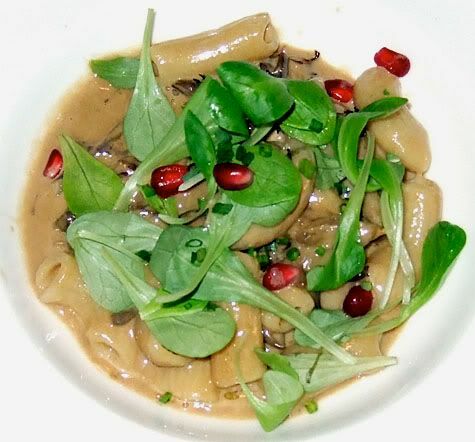 The Fresh Rigatoni Pasta (18) was tossed in a super rich sauce made with fois gras cream, maitake mushrooms and marsala wine, and then topped with baby arugula and scattered with brilliant red pomegranate seeds.. 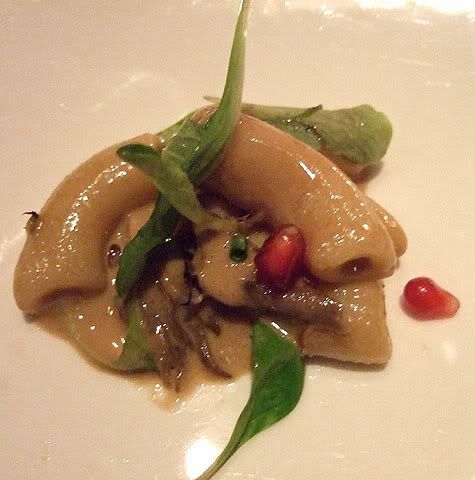 This dish was ponderously decadent and exuded calories, even the arugula felt fattening! The pomegranate seeds brightened the dish both visually as well as adding perky bright zesty tastes when you bit into them. 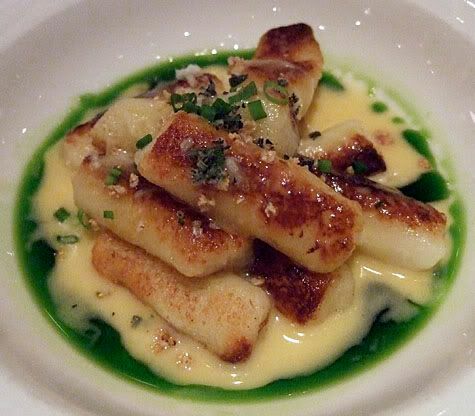 The gnocchi was rolled or drizzled with parmesan, which became browned and crisped with the most delectable toasted cheese flavor imaginable that is difficult to describe and impossible to forget… The interior was soft and creamy and slightly sweet from the mascarpone cheese, an addictive combination with the rich buttery sauce drizzled with a delicious and vivid herbal infused oil. An intoxicating aroma rose from the delicate shavings of parmesan and freshly chopped sage sprinkled on top. 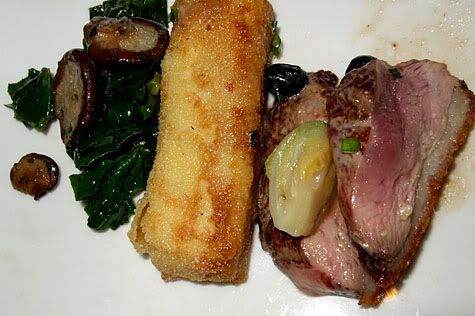 Seared Liberty Farm Duck Breast (29) with baby shiitake mushrooms, panisse, spinach and huckleberries. JT requested that they cook the breast beyond seared, more like medium, it was still pretty dark red, but was incredibly tender and juicy. The dish was served with fried chickpea fingers that had been dusted with cornmeal, along with tiny pieces of halved brussel sprouts and topped with chopped chives. The small huckleberries were overly aggressive and we agreed that they were best treated as inedible garnish… everything else worked together very well. 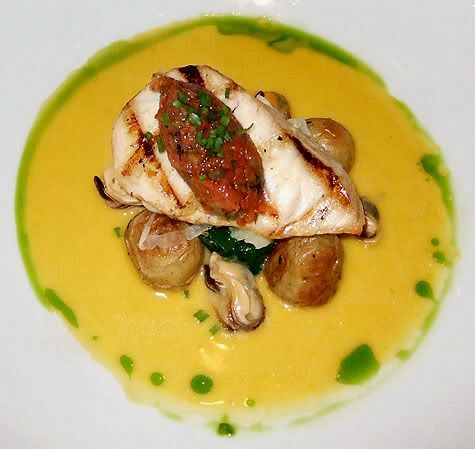 We all loved the Grilled Hawaiian Walu (23) which was topped with roasted tomatoes and served in a brilliant saffron sauce ringed with a vivid green herbal tincture, and included roasted fingerling potatoes, steamed spinach topped with shaved fennel that looked like transluscent melting shards of parmesan cheese. There were a few succulent Prince Edward Island mussels swimming in the rich golden sauce. None of us had ever heard of Hawaiian Walu, which was meaty but tender and very juicy. 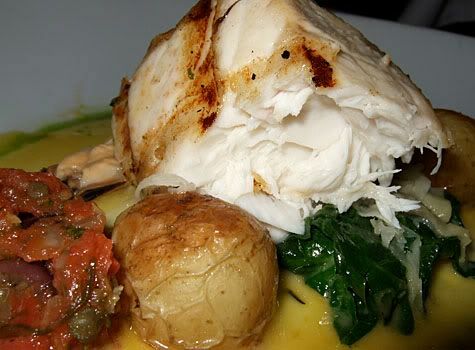 It was ethereal and substantial at the same time with a rich lush texture similar to salmon or halibut. 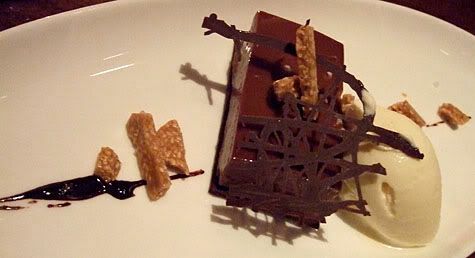 We were all stuffed but after looking at the dessert menu, we couldn’t resist the Milk Chocolate Tahini Ganache with cocoa sable, honey sesame ice cream, and sesame praline (9). My gawd the ganache was so rich and creamy, it was like eating a bar of butter… I think that we all agreed that the sesame praline bits were the best part, sweet, crunchy, sticky and buttery tasting. They were like the cellophane wrapped candies in the health food store, but these were decadently rich and not so healthy. 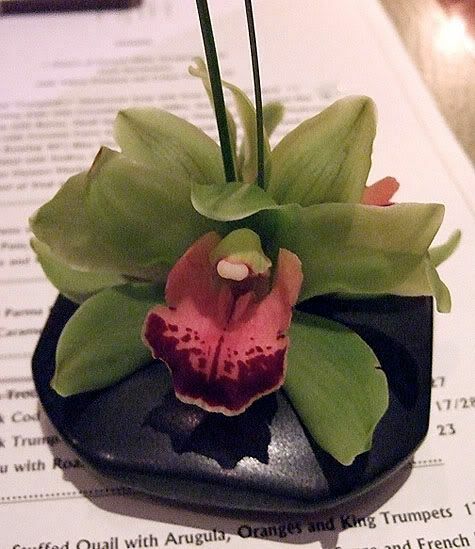 There were so many elegantly beautiful floral arrangements throughout the interior, I admired even the individual display at our table. 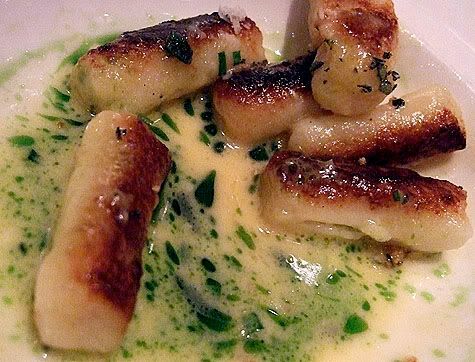 It was a fantastic and memorable meal, my only regret is that I procrastinated to the end… I hope that the new owners keep the gnocchi dish if nothing else and I will keep my eye out to see where Chef O’Brien ends up. One other thing is that the chef from cafe next door, Ryan Scott, is rumored to be on Season 4 of Top Chef, which I will be sure to watch next month! go Chefs! Wow, looked like a marvelous meal! I too proscratinated and didn’t get a chance to try Myth under O’Brien’s tenure (named Food & Wine’s best chefs in America last year). Did they do anything to mark his last night at the restaurant? The gnocchi looked unreal and that plating of the Hawaiian fish was so beautiful. But how come the poke wasn’t raw? In Hawaii poke is supposed to be raw. But it did look good. 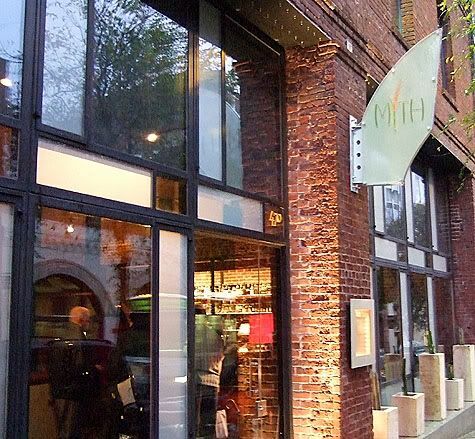 I love Myth Restaurant! Great post! 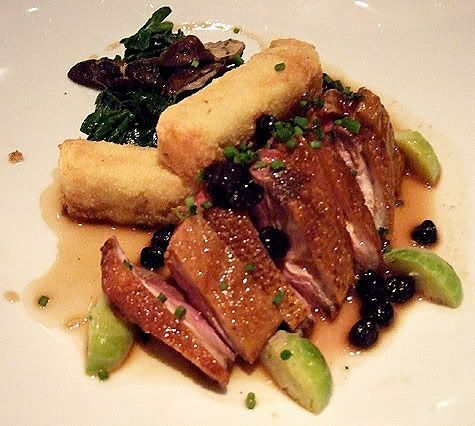 Incredible, look at the food, the duck, It’s just marvelous! Oh, I wish I was there!